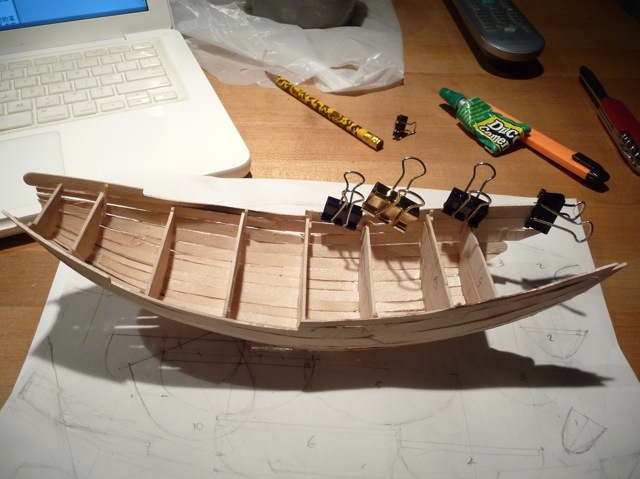 I always liked the sleek and graceful lines of boats and always had the urge to make model boats. 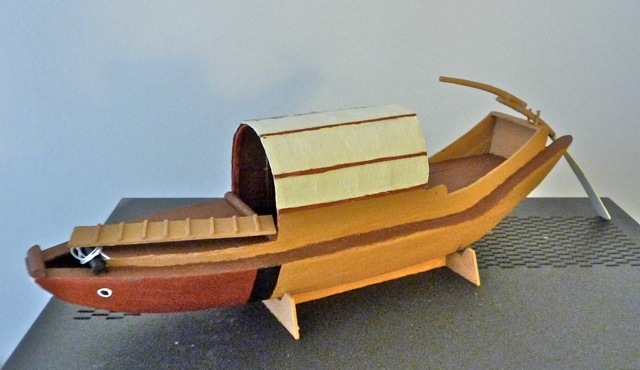 After making the Alaskan seal skin boat model, I was on a roll. 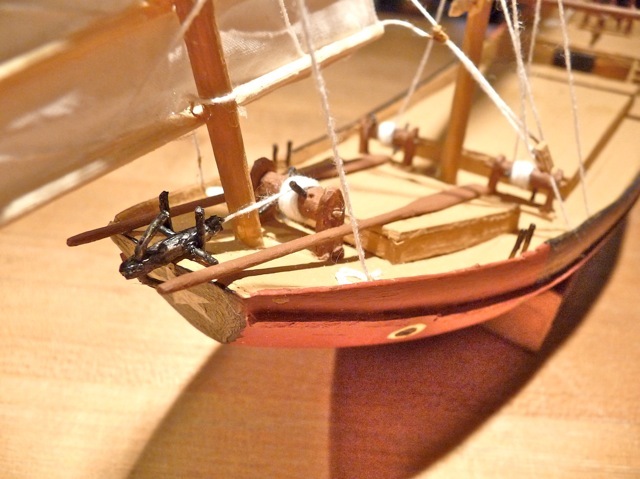 I wanted to continue making models of boats I liked. This started an obsession that lasted two months, so far. 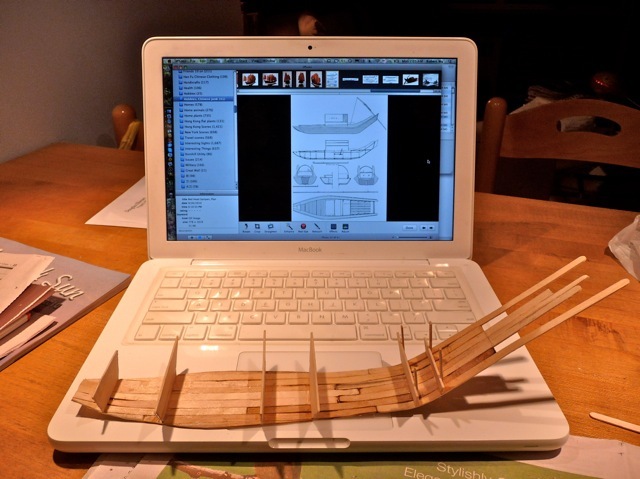 I made models until 2AM every night and neglected my exercises. 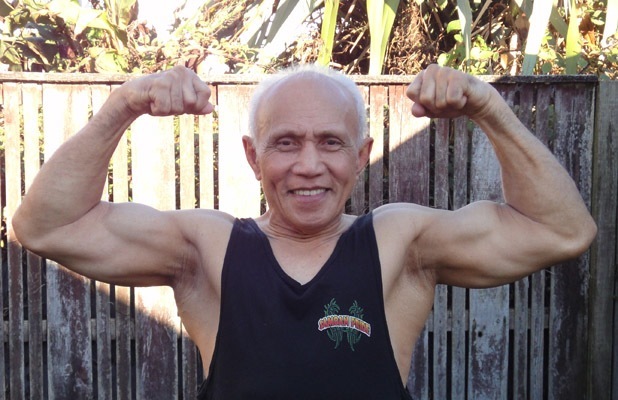 My body shriveled and I lost my chance to look like this 74 year old man. After urgings from Sally and our daughter Tammy, I have finally resumed my weight lifting exercises. 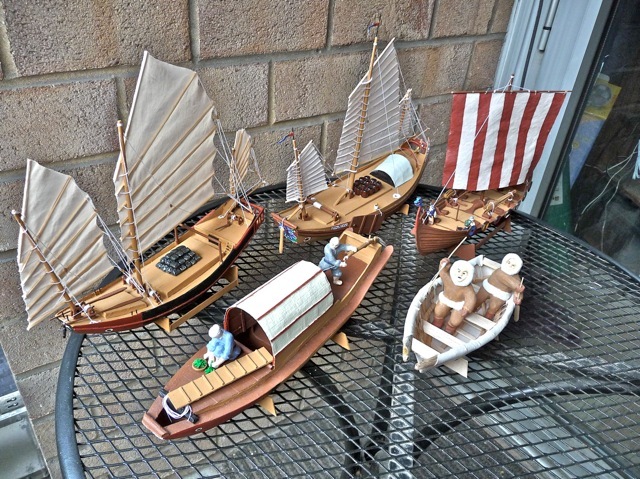 After two months of labor of love, I produced five model boats. 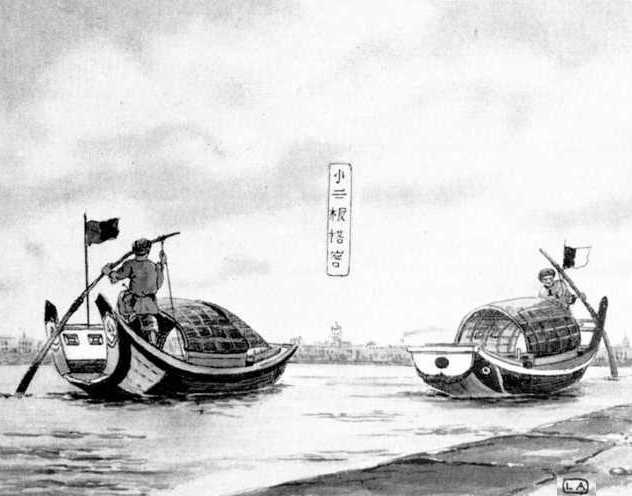 These sampans plied the canals of Shanghai region before they were displaced by motorboats. They got their names from the red colored bows. 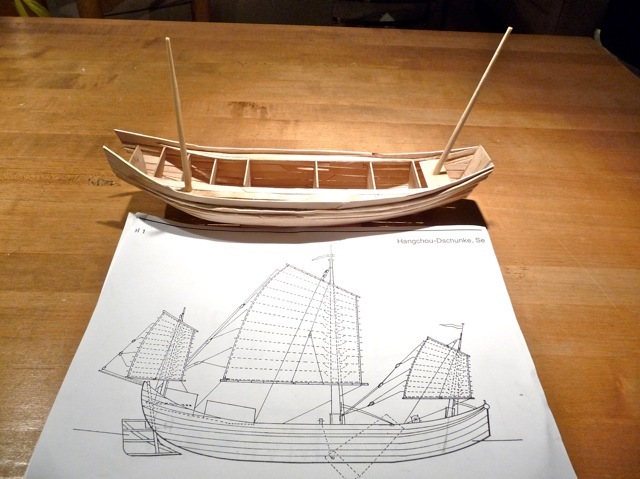 I found the plans to make a sampan from the web, and proceeded to make this model with wooden coffee stirrers. 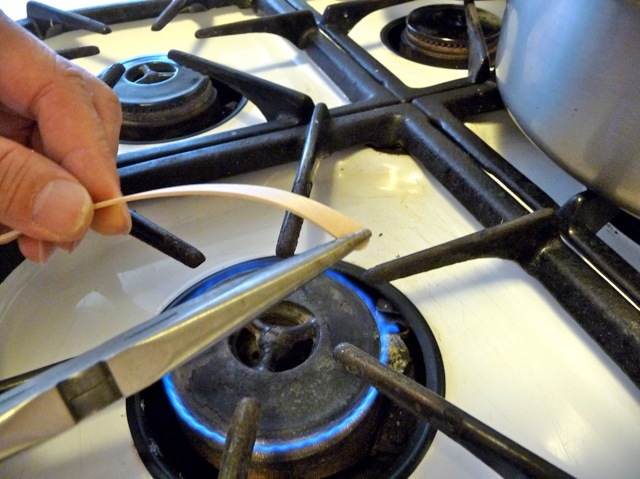 After soaking the stirrers in water, I bent them into any shape over a slow fire. 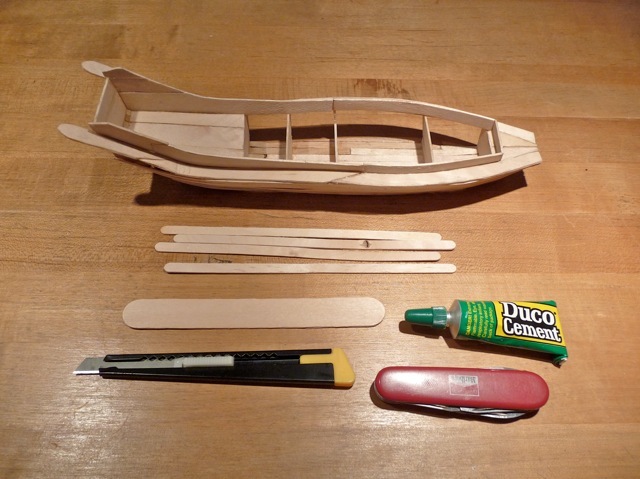 Glueing the stirrers onto bulkheads, the boat started to take shape. 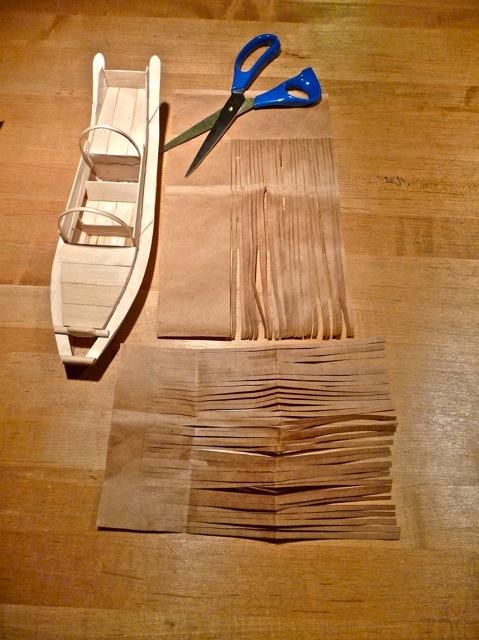 I cut a brown paper bag into strips and wove them into a miniature mat to use as the boat’s canopy. 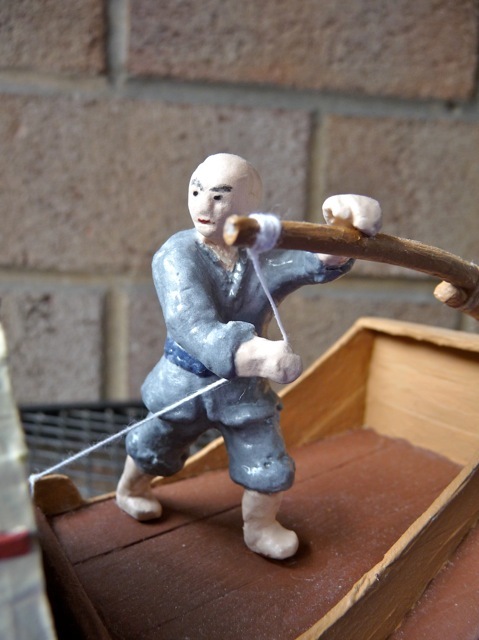 The finished sampan is propelled by a single sculling oar. 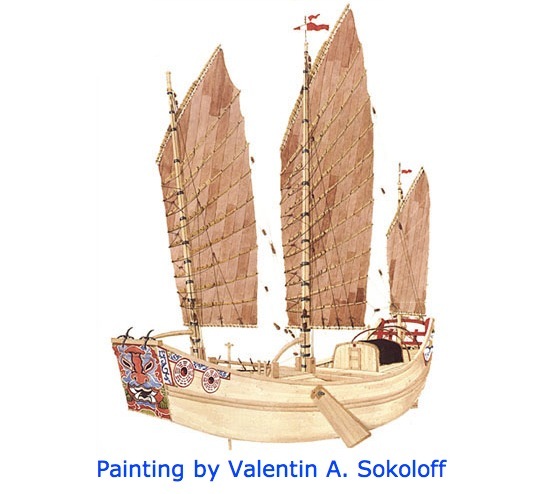 Three main types of sea-going junks sailed the coastal waters of China. They were the flat bottomed sand junk (沙船), the deep-hulled FuJian junk (福船), and the similarly deep-hulled GuangDong junk (廣船). The sand junk got the name from its flat bottom which allowed it to beach sand bars but also allowed the junk to slide sideways in the water. The leeboards on its sides functioned as a keel, kept the junk cutting straight through water and enabled it to sail upwind. 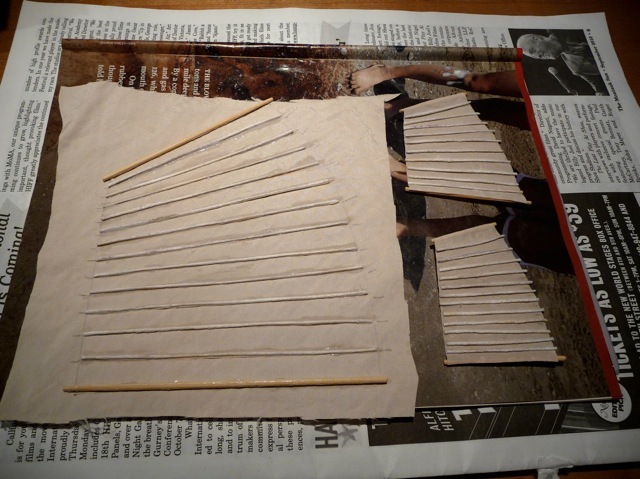 Starting with a plan found on the web, I made the hull using coffee stirrers and chop sticks. Details were attended to. The stern had a rudder that could be raised and living quarters accessible by a sliding door and stairway. 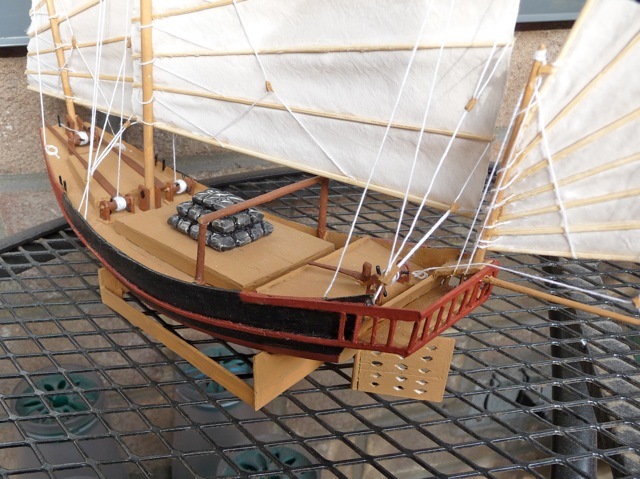 The battens that stiffened that Chinese sails were glued to a piece of fabric. I made stacks of pottery urns in the ceramics workshop and let the junk carry them as freight. In keeping with tradition, I painted a dragon’s face on its bow. 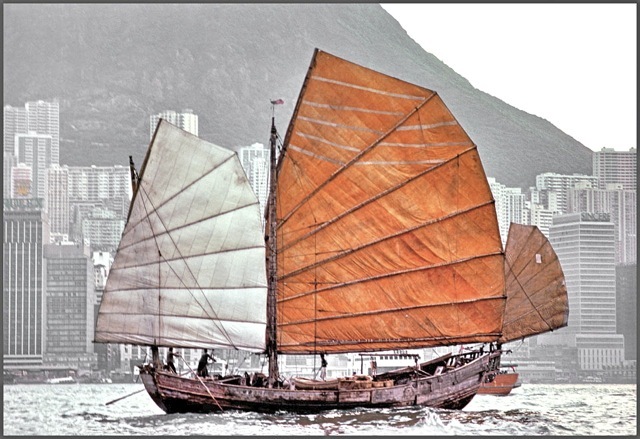 Hong Kong was a base for countless junks plying its waters. These junks fished, carried freight and passengers, and even conducted piracy. The junk is still being used as a symbol of Hong Kong. Even as almost all boats are motorized, one sailing junk is maintained by the Hong Kong Tourist Association to attract tourists. The Hong Kong junk is a kind of the GuangDong junk (廣船). It is distinguished by large bat wing sails. Its affectionate nickname, big eyed chicken (大眼雞), refers to the painted eyes on its bow. 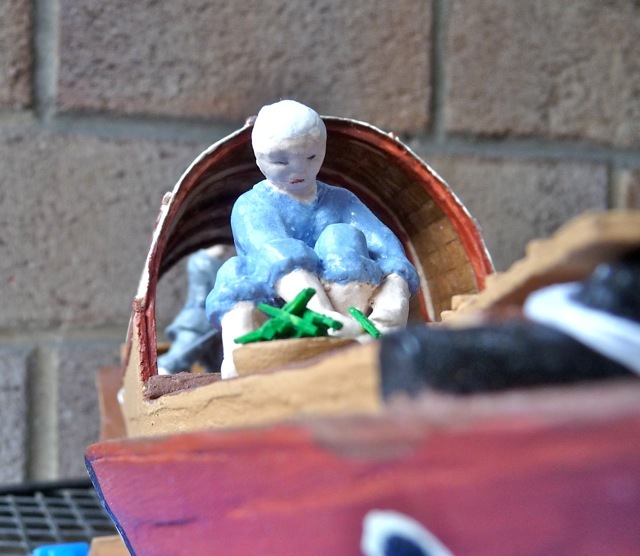 Without the eyes, the ship would get lost in the high seas. 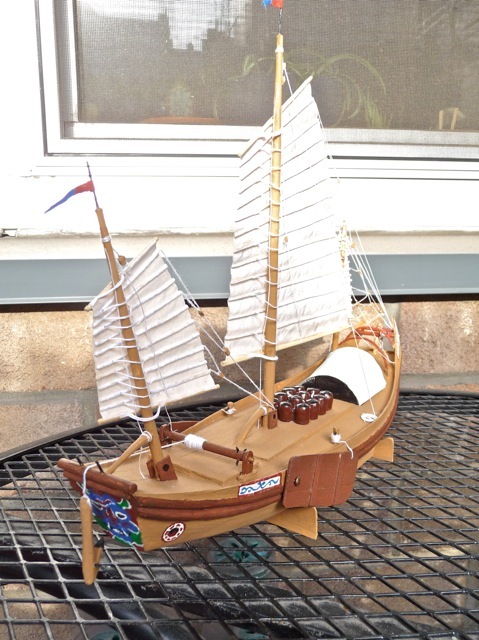 My grand-uncle introduced Cummins diesel engines for junks to Hong Kong in the 1950s and initiated the demise of these sail boats from Hong Kong harbor. 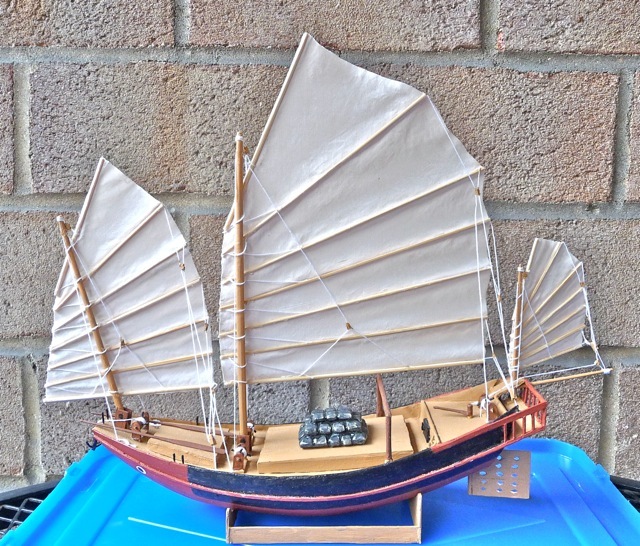 Using many old photos of Hong Kong junks such as this one, I ventured to make a model from photos alone. Drawing my own plan, I made the hull on watertight bulkheads. Three masts were installed. The rear-most mast was sitting on a flimsy structure cantilevered from the junk stern. I always wondered why it was so constructed and how it would stand up to storms at sea. I still don’t know. This Hong Kong junk carried sacks made in the ceramics workshop. The bow carried two auxiliary oars to slowly propel the junk when the wind dies. This big eyed chicken looked ready to tackle the rough South China Sea. When we were in Norway in 2003, we visited a museum and saw the salvaged Viking longboats. We were immensely impressed by their gracefully sweeping lines and wondered how the Vikings fashioned such beautiful ships. 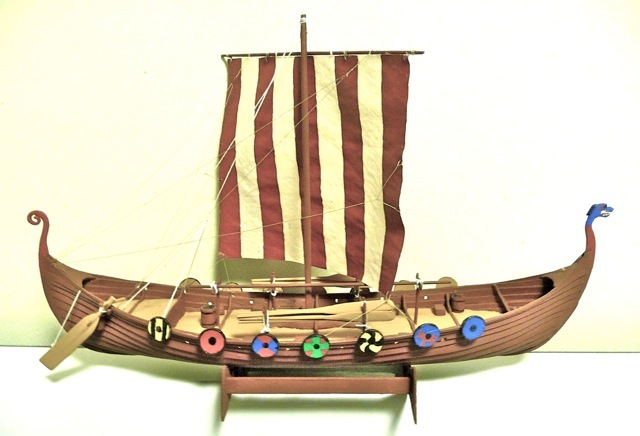 Commercially available longboat models are sold for hundreds of dollars. I strove to make one similar to this well-made one. 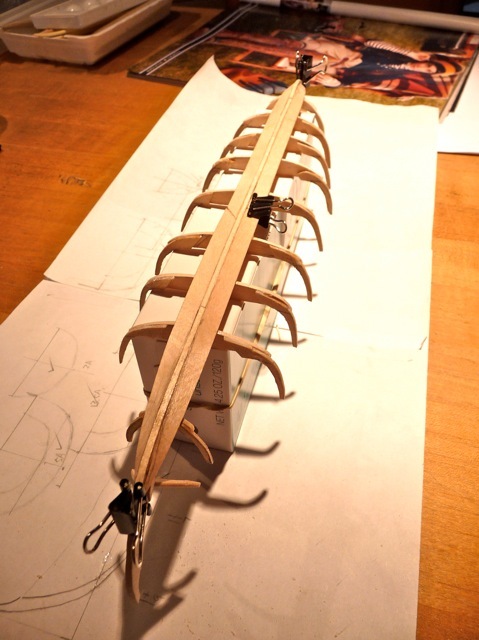 Starting with ribs and a keel, I carefully bent coffee stirrers and glued them to the frame. 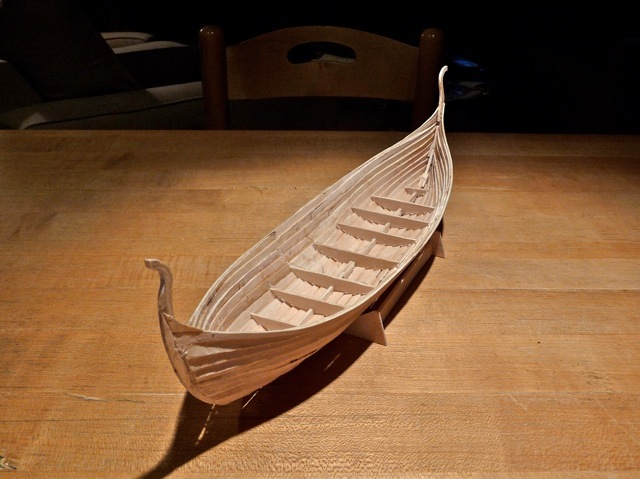 After days of careful work, my model gained the graceful shape of a longboat. 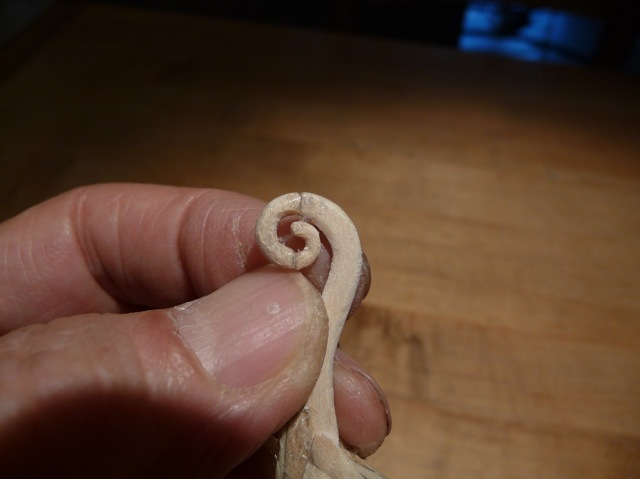 I carefully carved and glued pieces of wood to form the circular tail of the dragon boat. 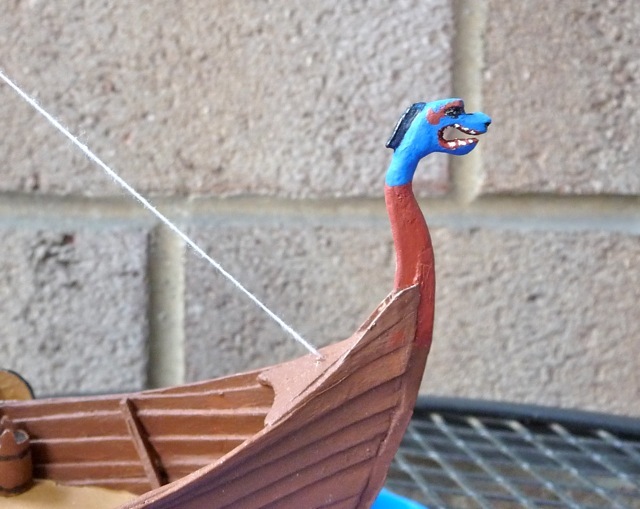 I carved the dragon head for the longboat, but it looked like a Chinese dragon. 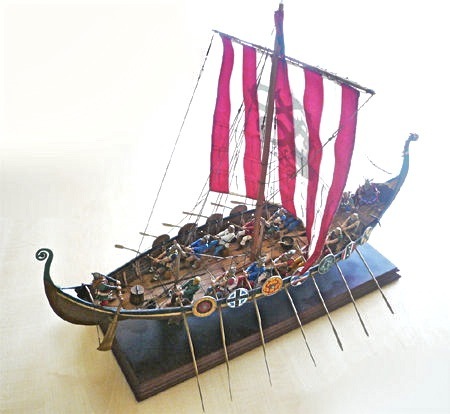 It would look out of place on a Viking longboat. 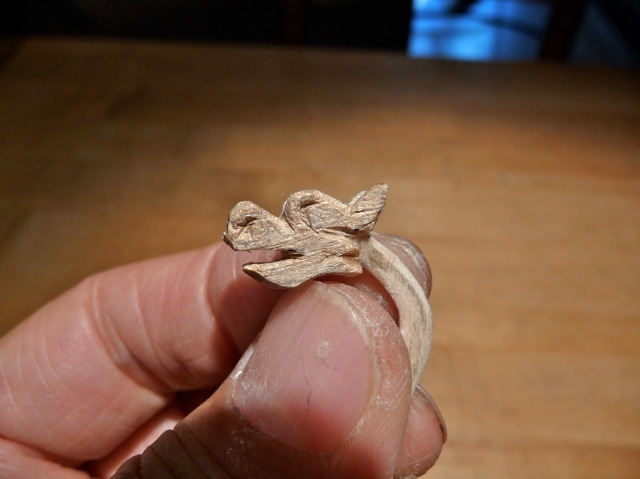 I carved another Nordic dragon head and it looked fierce and at home on the longboat. 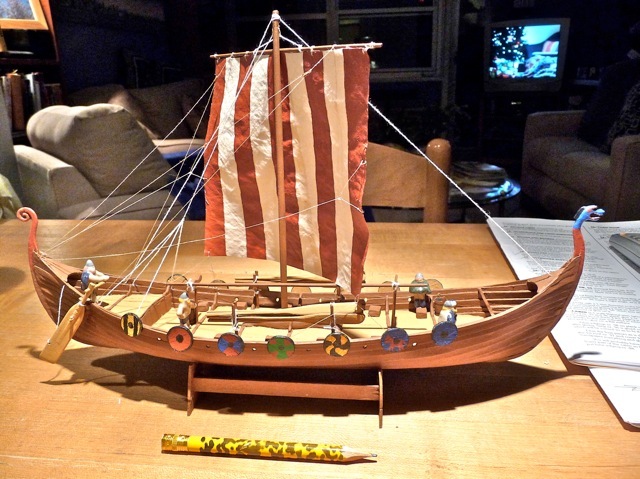 The finished longboat with shields and oars. All it needed was a crew to sail it on raids. 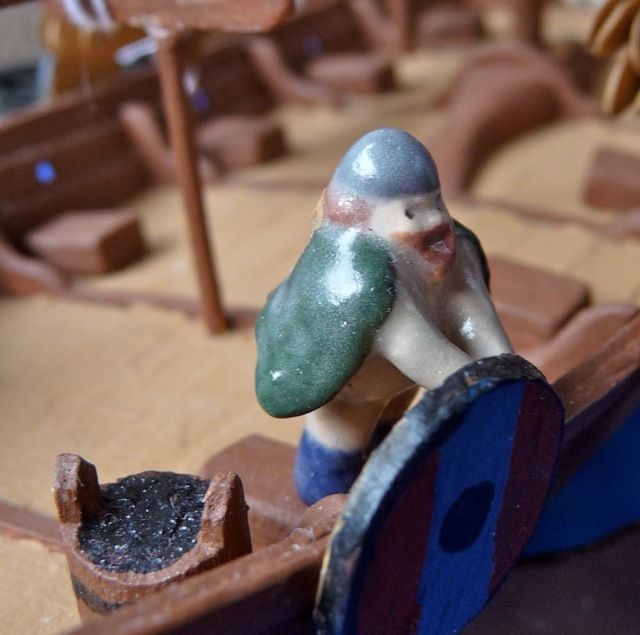 Taking advantage of the ceramics workshop at the senior center Sally and I joined, I made Viking figures to sail the longboat. They were only 3/4 inch tall, but they were armed with tiny swords and helmets. This one surveyed the sea in bright sunlight. 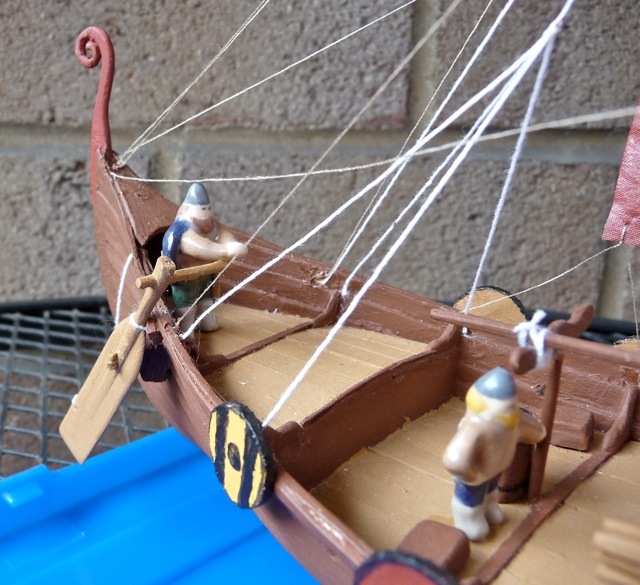 This short Viking stood on a rowing seat to look over the longboat’s side. 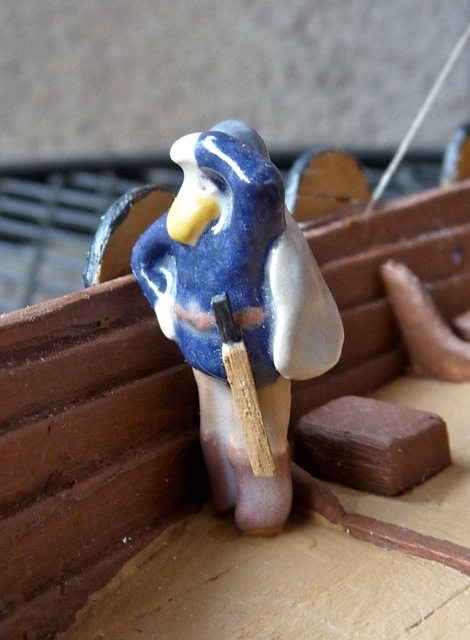 A Viking tended the steering rudder while his mate relaxed on deck. 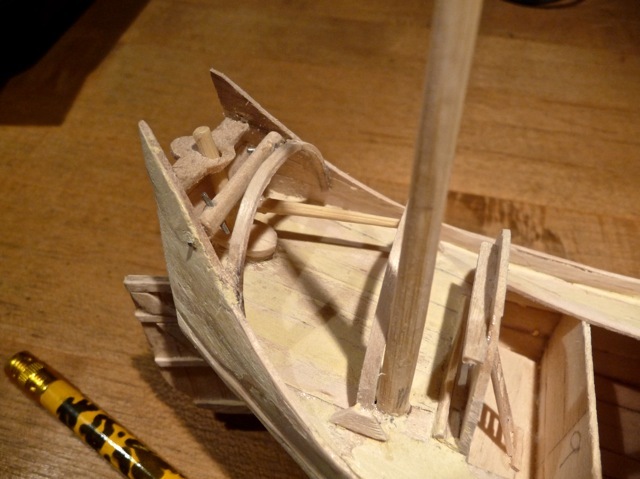 With its skeleton crew on board, this tiny longboat was ready to sail the North Sea. 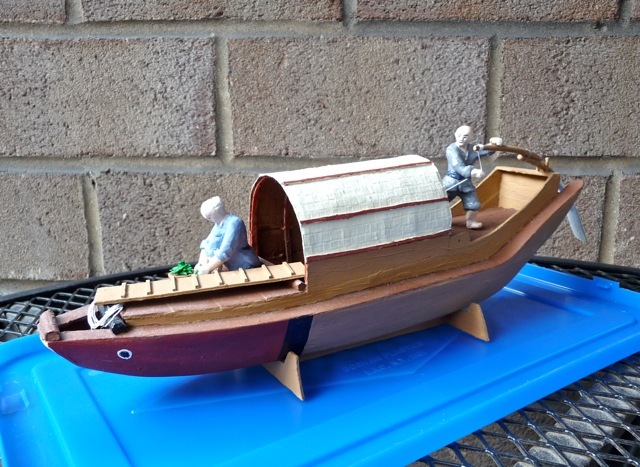 I also made two figures to populate the Red Head sampan. The boatman sculled the sampan in the Chinese manner. His wife sat on the deck to fix lunch. This is an idyllic image of a family living and working on their small sampan. 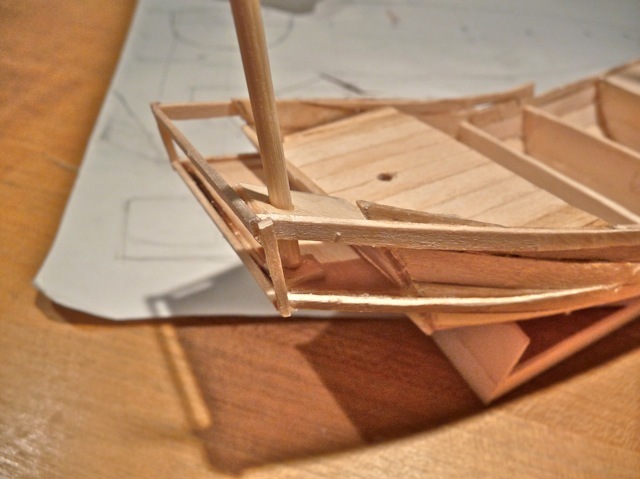 After making five boat models in two months, I am still not satiated. 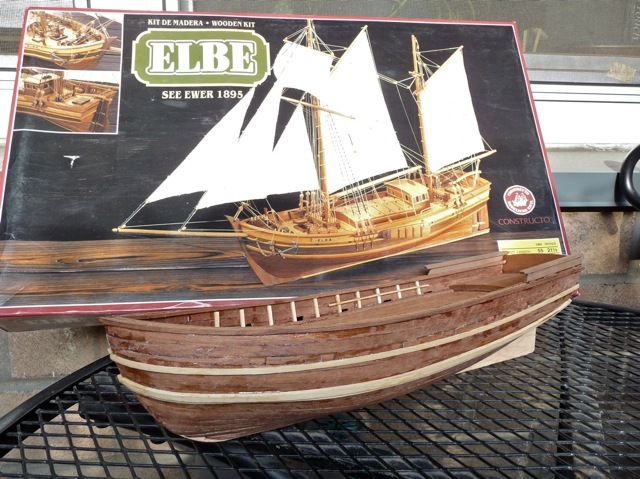 Fifteen years ago in France, I bought a wooden sail boat model kit. I finally dusted it off and started to make it. In time, it too will be displayed at our home. Posted by Robert Wu on Friday, November 26, 2010, at 8:57 am. Filed under Uncategorized. Follow any responses to this post with its comments RSS feed. You can post a comment or trackback from your blog.